Wahama junior Ethan VanMatre locks in a hold during a 120-pound match against a George Washington opponent at the 2017 Jason Eades Memorial Duals held on Dec. 8 in Point Pleasant, W.Va.
MILLWOOD, W.Va. — It was a decent showing for the White Falcons. 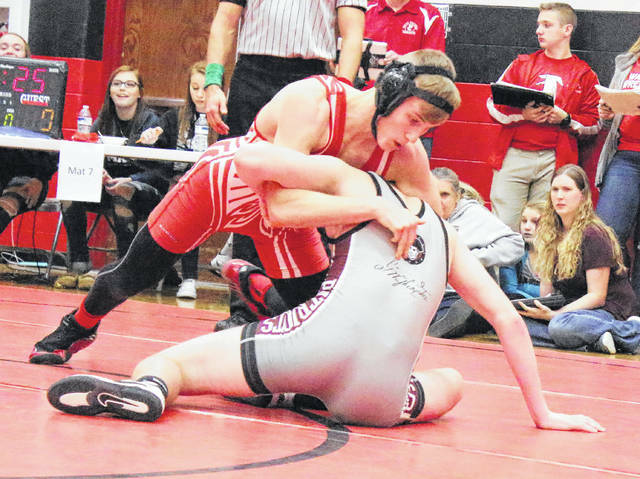 The Wahama wrestling program earned two divisional championships and finished sixth out of 17 teams on Saturday at the 2017 Jackson County Invitational held at the National Guard Armory in Jackson County. The White Falcons had only three grapplers land top-four finishes at the annual event, but two of those ended up being first place efforts en route to a final team score of 79 points. Point Pleasant also sent a secondary team to the event, and the Big Blacks had three top-four efforts while placing 12th overall with 44 points. Bellaire (OH) won the team title with 188.5 points, while Wirt County (122.5) and Williamstown (109.0) rounded out the top three spots in the field. Juniors Ethan VanMatre and Antonio Serevicz came away with top honors in their respective weight classes for WHS. VanMatre went 3-0 with three pinfall wins at 126 pounds, while Serevicz scored two pinfalls and went 3-0 at 220 pounds. Senior Ethan Herdman also finished third at 152 pounds with a 3-1 overall mark, which included a pair of pinfall victories. Caleb Lane went 2-1 and had two pinfall wins while earning Point Pleasant’s top finish after placing second at 126 pounds. Parker Henderson (106) went 2-2 and had two pinfalls to place fourth, while Dakota Moses (220) finished 4-2 overall and had four pinfall wins while placing fourth. Bellaire led the event with five individual champions, followed by Wahama, Wirt County and Roane County with two apiece. Williamstown, Calhoun County and Nitro also came away with a weight class champion apiece. Visit wvmat.com for complete results of the 2017 Jackson County Invitational.